He's back!! Warner Bros has dropped off the first official photo of Henry Cavill as Superman in the sequel Batman v Superman: Dawn of Justice, currently in production. This compliments that first moody black & white photo of Ben Affleck as the Batman, which was our very first shot from the sequel. 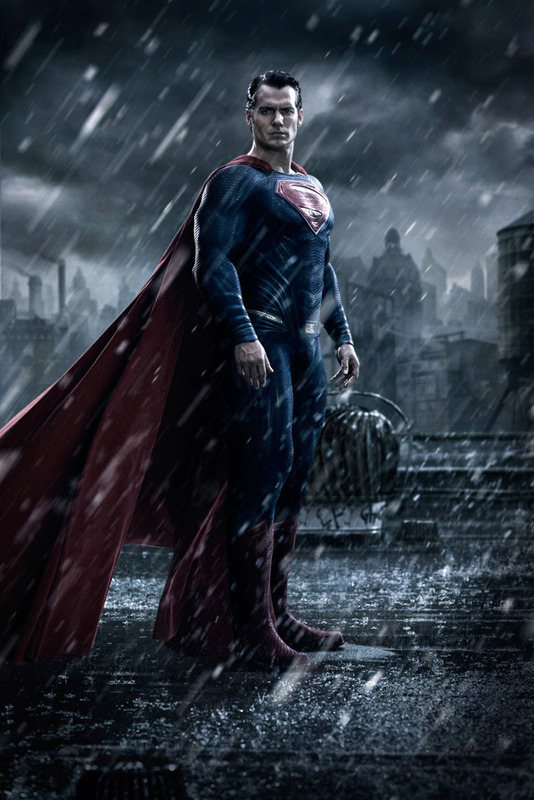 Thanks to an early leak of Henry Cavill on set supporting a charity, Warner Bros has followed-up and just put out this very comic book-like shot of Superman standing in the rain, with his full Superman outfit. There certainly seem to be a few tweaks (like extra ribbing underneath his actual ribs), but it otherwise looks quite similar. Zack Snyder's sequel Batman v Superman: Dawn of Justice in the DC Comics Universe will bring back Henry Cavill as Superman and introduce Ben Affleck as Batman. Amy Adams, Laurence Fisburne and Diane Lane are all reprising their roles from Man of Steel, while more new additions include Gal Gadot as Diana Prince/Wonder Woman, Jesse Eisenberg as Lex Luthor, Jeremy Irons as Alfred, and Holly Hunter in a role newly created for the film. There have also been rumblings of Ray Fisher as Cyborg and Jason Momoa also has some sort of role. Batman v Superman: Dawn of Justice hits theaters on May 6th, 2016. Stay up to date on the highly anticipated sequel by following @BatmanvSuperman on Twitter or its Facebook page. Thought the same thing. Nice shot. Setting the tone early. 2016 release & shooting already. Wow. Oughta be something. Cavill looking mighty Sup-ey! I think this and Star Wars VII are my most anticipated trailers right now. The first Man of Steel had a great trailer. Shame that the film couldn't live up to what film the trailer promised. Photo or digital painting? Getting hard to tell these days. dark superman's about as legit as a light se7en. Count me out. Super hero movies should just disappear for a while until they have actual stories, and not segues to films to follow. Yes. I'm still uninterested. Interest level: 0. Reasons: Unlimited. It's just an opinion, no worries. I'm not shaming anyone who's into it. So uninterested you have to tell the world in discussion field under the zero interest article. Weird. But as you say, your opinion.. of zero interest 😉 On the other hand: Luckily D.C Comics has done heaps of versions of Superman and Batman much darker than this...Even friggin Donald Duck can be dark and be legit. I agree in the stop making movies argument though.. although i would change superhero movies with remakes. Id rather see a junk superheromovie with a "new" script than a super good classic remade. not since chris nolans first batman film have I been this excited for a superhero film....can't wait for more info on JL movie too! I like it. It's like he's no longer a youngster, but a real grown man. I look forward to this, contrary to most people I thought Zack Synder's first film was entertaing and a pleasure for the eyes (for the ears not so much, but hey). If that is Gotham, I am curious to find out why the man of steel would be seeking Batman out. Perhaps a connection from Wayne Enterprises to LexCorp? No doubt that Batman will be at odds with Superman's decision at the end of the last film. I don't want to be excited about this because I just didn't think that the previous film delivered. But with some of the development's, I have to say that I am slightly intrigued. They've subtly modified the costume, like they said. The most noticeable change is the buckle of the belt. Have to change my shorts now. Nice pic, I personally can't wait for this movie. I so badly want this film to be good. It has such potential. The two greatest superheroes of all time in the same movie. As you can tell from my avatar (which I've had for years, long before this movie was ever announced) I am a huge fan of these two iconic Heroes. I just hope that they are not rushing into a Justice League film to compete with marvel but instead they are making it simply for the sake of making a great film.